Watch the sea lions bask in the sun and the lights come up in the harbor at sunset --- but don't miss the food at this locals' favorite. 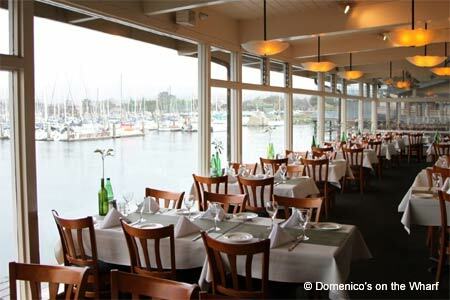 : Old-school service and true hospitality characterize the Domenico’s experience. Diners in suits or shorts are welcomed with equal respect by a knowledgeable waitstaff serving seafood with a view of the harbor. Canine companions are also welcome --- they may dine on goodies such as "Chicken a la Pooch." Oysters Rockefeller come topped with caviar, and tomato-ginger soup is a tangy change of pace from clam chowder. Fresh fish and seafood are the stars of this family-owned operation, and sauces and sides highlight seafood flavors rather than mask them. We like the sweet and salty bacon-wrapped scallops cooked to tender doneness. Fans of Discovery Channel’s “Deadliest Catch” won’t want to pass up the Alaskan king crab right off the Time Bandit fishing vessel. Silky chocolate mousse or chocolate espresso cheesecake provide sweet endings to the meal.